Hi my crafty friends and happy Sunday. I hope you have a great day whatever you have planned~ Spending time with family and/or friends, getting things done around home, shopping or crafting! Should be a wonderful day!! Today, I have another Halloween project to share with you...hope you like it! I am lovin' all the fun Halloween idea's out in blog land lately! How about you? It was a bit of a challenge to get it together but you just have to go slowly and be sure the glue sets before continuing on. I definitely loved the end result! I used papers from Echo Park called Dots & Stripes for the boot and black gingham ribbon for lacing up the boot. I tied a fun double bow and added a fun button to the center. The spider on the tip of the boot is cut at .66 using my gypsy and the Mini Monster cartridge. I hot glued the boa on~which I think adds a great touch. I filled a cell bag with yummy Hershey chocolate almond kisses and tucked it in the boot. I tied it up with gingham ribbon and added a tag. The tag is from My Craft Spot's Jar Basics Die set, then stamped and heat embossed the sentiment with the Spooky Treats stamp set. It would make a great party favor or table decoration to! 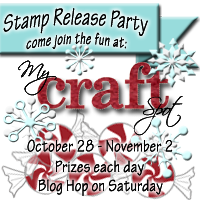 Don't forget to be back tomorrow for My Craft Spot's Winter Stamp Release Party!! So darn cute, love the maribou trim! OMYGOSH!!! This is AMAZING!! I just loveeeeeeeeee it!! PINNING!!!! OMGosh This is so adorable! I love it!!! Fabulous design and colors. Defintely worth the effort it took. Thanks for playing with us over at Loves Rubberstamps!!! Oh my gosh, how fabulous is this!! I love the design!! You always add the perfect touches that take a project from awesome to stunning!! The boa looks amazing and that little spider on the toe - so stinkin' cute!! I just love this my friend!! You did a spectacular job!! This is AWESOME Sherrie!! What an AMAZING Halloween project! The paper, the embellishing and the whole overall design is FAB!! Thanks for sharing and linking this up over at 3GJ for our Anything Halloween w/Ribbon challenge! I think this project is absolutely amazing! Have lots of fun today. The boa trim really finishes it. OK!! this is AMAZING!! Beautiful!!!! Love the gorgeous Bow!! WOW this is fabulous! LOVE, love this! Have a great day. Love your witches boot Sherrie,the lacing looks terrific.Hope you are having a great day. This is terrific Sherrie! What a fun cut, and I love the texture the feather boa adds! Hope you had a fun day with your family!! Super fabulous project Sherrie!! Love the boa and cute spider on the toe. Have a fabulous time with your family!! This is the coolest treat holder I have seen! Just adorable and so many great details! Thanks for playing with us at Loves Rubberstamps! Happy Birthday to your dad, Sherrie! I hope your celebration has been magical. :o) As for this project... I am a wee bit stunned (but not surprised) at how much detail you packed into this. What a spectacular treat box! The Silhouette Store contains so much inspiration, but it is the crafter's touches that make the cuts masterpieces. You never miss a beat, my friend! The boa, the spider, the gorgeous ribbon for the laces.. it's just perfectly done! You are super woman to be doing so many projects other than the MCS release posts! I am in awe. :o) I hope you have a wonderful night, my dear friend! Sherrie this is so darn cute!!! I mean its Boot-iful!!!! Oh and I dare, I dare...gimme, gimme!! Love this (and everything else you do)! Have a great time and I'll keep the boot company, while you're away. Have a fabulous Sunday night! (sorry, I've been slow getting around) its been a busy week at work and home. It's all good though...so its a good thing. Hope your Dad had a special day! I bet he did surrounded by friends and family! This is just the cutest! You always make the most darling 3D projects! this turned out great!! I bought that same file and my first try ended up in the garbage can :-) Love the boa!! WOW.......this is fabulous, love your fun project. Love all the feathers too! 3-D projects are so fun and who doesn't like a little treat. Thanks for sharing your fun project in the 3 Girl JAM Halloween with Ribbon challenge. Thanks for entering our challenge at 4 Crafty Chicks, great job! Oh my gosh - this is just over-the-top FAB-U-LOUS! I love the boot and all the amazing embellishments, especially that boa trim...eeeekkkk! I love the shoestring, the spider, the sentiments, it's all just amazing. Great Halloween project my friend! Over the top fabulous my friend!! This is one of my favorite projects you have made! I just love the shoe and how you embellished it! Congrats on having it featured by Paper Issues as well!!! Sherrie ~ OMG ~ you know how much I ADORE this (my boot) Seriously WICKED!! I honestly don't know what to say but I want this!!! STUNNING!!! This is Beyond AWESOME. Absolutely Gorgeous my friend. Hope had fun with your family and that your Dad had a great Birthday. AMAZING Sherrie You are so very talented. Love the design, the papers and all the added touches that you do so well. Fabulous my friend. Oh Sherrie this is gorgeous! I too, love it!